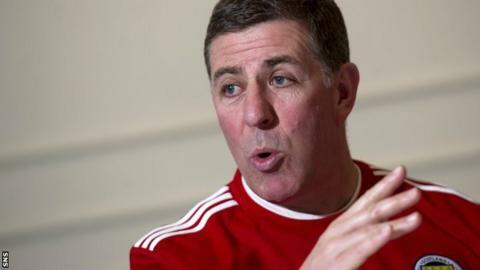 Mark McGhee has revealed that he had to ask the over-enthusiastic Scotland players to ease off during their first training session under the new regime. The squad is preparing for Wednesday's friendly against Estonia at Pittodrie. "With that bit of nervousness with a new manager and new voices, there was a great deal of enthusiasm to the point where at times we had to say 'calm down'," said assistant manager McGhee. "The early part of the little game we played was a little bit hectic." The Estonia match will be new Scotland boss Gordon Strachan's first in charge of the national team since he was named as Craig Levein's replacement on 15 January. He has been helped in his preparations by McGhee and Motherwell manager Stuart McCall, who watched most of the 28-man squad go through their paces at Aberdeen Sports Village. James Morrison, who played in West Brom's home defeat by Spurs on Sunday, was one of the players permitted to rest. For Strachan and McGhee the friendly match means a return to Pittodrie, a ground they graced in the 1980s with a powerful Aberdeen side, though the latter's spell as manager there ended on a low point two years ago. "Pittodrie remains a positive place for me," said McGhee. "We are going back there not as club people but national coaches and we would expect the audience to be a national audience and therefore to get behind the team and get behind us. "I have no fears that won't be the case." Despite having managed several other clubs, including Reading, Wolves, Motherwell and Bristol Rovers, McGhee admitted to being nervous in his first day on the training ground with the Scotland squad. "Before every new job you have a certain amount of nervousness, you are getting to know players," he explained. "It is not that long since I was coaching but in the first few minutes you hear your own voice, you hear yourself talking and you get a little bit of an out-of-body experience because you are nervous about how you are sounding. "But you settle into it and it is fine. "It has been a long, long time since I took a warm-up. "Whatever we do, whoever we play, and however we train, Gordon is the architect of that and Stuart and I are the civil engineers; we put it together, as it were. "We are only there for Gordon and what happened today is what will happen. "When it came to the part of the training that was appropriate to what we are going to be doing in terms of the game, Gordon stepped in and it was his input then." A former striker, McGhee says he wants to discuss the position with those competing for places up front - namely, Steven Fletcher of Sunderland, Leeds United's Ross McCormack, Jamie Mackie of QPR, Wigan forward Shaun Maloney, Vancouver's Kenny Miller, Everton's Steven Naismith and Blackburn's Jordan Rhodes. He has challenged them to put down a marker for their own inclusion in the team and to prove that the national side should play with two men up front. "One of the things you have to do at any level is score goals," he added. "There seems to be a form about the players which is positive. "I think if we can engage that in the game and take that club form in to the international game then we will be good enough. "I think we have enough ability in the squad, it is now up to us to put it together in a way that gives them the opportunity to express themselves to the best of their abilities."